RUH ROH VICK IN PHILLY! Pass me the popcorn fellas. This is going to be very interesting. Puppy killer Michael Vick in the city of Brotherly Love? This could have disaster written all over it. 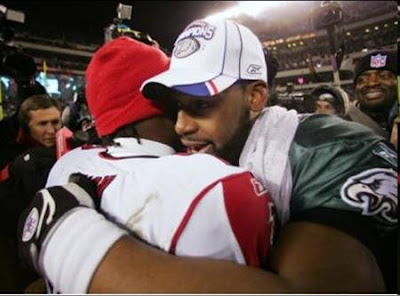 How will Donovan McNabb react to Vick being his backup? How will Andy Reid handle the press that comes with signing a player with the baggage of Michael Vick? What kind of pound puppies will the Philly faithful throw at Vick when he fumbles for the third time in a crucial game because he handles the rock like it's a hot potato? It's good to have Vick back in the NFL. He kind of just writes the blogs himself while I sit back and watch. Welcome back Vick! I can't wait to see him return to Atlanta on December 6th in the green and white. The racial tension should be fantastic. We just got in stock the new 2009 Official Wilson Notre Dame NCAA Football. These are the same exact footballs they use starting September 5th against Nevada. Same size and weight that Golden Tate and Michael Floyd will be catching this fall. I am pricing them at half the price of what Football Fanatics offers them at so you are getting a great deal for only $99. Be sure to order them quickly because I have limited stock. First come first serve. YOU KNOW HOW I KNOW YOU'RE A DOUCHEBAG? It's been over a 100 years since the Cubs won a World Series and honestly I can't remember off the top of my head the last time the Cubs actually went to a World Series but they still have fans who act like complete douchebags. Could you imagine how insufferable Cubs fans would be if they actually won something? They would turn into the Red Sox bandwagon nation. Frightening to think of it. It looks like from the video the wrong guy got thrown out for tossing the beer onto Shane Victorino's head. Too bad. First you waste a perfectly good beer by tossing it like a drunk moron then somebody else takes the fall while you cower in your seat.